I know this is unusual, but I have been keeping something from you. Usually, I tell you everything that happens, as soon as it happens. Well, this particular thing has been happening for about 4 weeks now. I guess it's about time I finally admit it to you, and myself. I have an issue. A foot issue. This is a huge reason why my running has been put off to the side. I am frustrated, and a little depressed that I'm injured. I have seen my chiropractor about my foot twice, and I think it's finally time to be referred to a podiatrist. My chiropractor thinks that I may have plantar fasciitis. Most people with plantar fasciitis have pain when they take their first steps after they get out of bed or sit for a long time. No single treatment works best for everyone with plantar fasciitis, bu there are many things you can try to help your foot get better. You can give your feet a rest. Cut back on activities that make your foot hurt. Try not to walk or run on hard surfaces. You can try putting ice on your heel. Or take an over-the-counter pain reliever like ibuprofen. You can do toe stretches, calf stretches and towel stretches several times a day, especially when you first get up in the morning. You can get a new pair of shoes. Pick shoes with good arch support and a cushioned sole. Or try heel cups or shoe inserts. Use them in both shoes, even if only one foot hurts. I'm not completely sure if I have plantar fasciitis, as I haven't been diagnosed by a podiatrist. I have a call in to my chiropractor for a podiatrist referral. When my husband rubs my feet (which has turned in to an every night occasion since I'm in so much pain) I can feel a lump move around, and it is extremely painful. I'm hoping I do not have a heel spur, because that sound just so much worse. 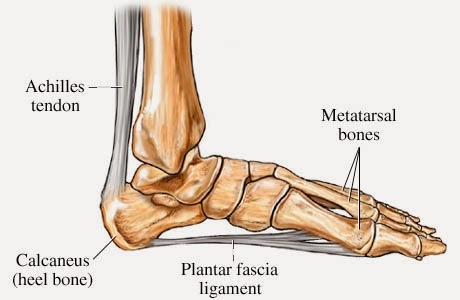 Readers: Have you ever had plantar fasciitis or a heel spur? What helped ease your pain? Can it be cured for a long period of time, or is it recurring? Agh, I feel your pain. I suffered from it from September 2012 till April or May of 2013. I'm overweight and used to walk on hard surfaces for an hour everyday. Also I seemingly have 'the tightest calf muscles ever' according to the specialist I went to see. I had to do exercises every day and ease up on my walking but it healed up eventually and thankfully I haven't any problems since. Eww! Been there and done that (but self diagnosed) I remember the pain getting out of bed and almost being hunched over to try and keep pressure off of my feet. No insurance so I just lived with it. I tried to wear supportive shoes always. The oddest thing that helped me the most was flip flops with really thick foot beds. http://www.ebay.com/sch/Sandals-Flip-Flops-/62107/i.html?_from=R40&_nkw=speedos+fun+womens+sandals&_nkwusc=speedos+fun+womans+sandels&_rdc=1 follow that as a link and it will pull up the listing on ebay. Sam's club sold them for about $13.99 and they worked like a dream for me. The footbeds took off a lot of pressure. After about 6 months of constant use the footbed is depressed where my feet rest but they are still comfortable for walking. Good Luck! I had it bad for several years. Disciplined stretching, ice, and good orthotic inserts worked together to heal me completely! Don't use tennis balls, golf balls, etc. to stretch, get an Oh Ball for sure. Its like $20 on Amazon. (www. TheOhBall.com) Best of luck to you.